Unlike chloroform and ether, the margin for error was small as a high concentration of nitrous oxide is required for adequate anaesthesia. Evans had administered nitrous oxide in india rubber bags via an oral pipe, with the nostrils occluded by an assistant. This was not an ideal system. 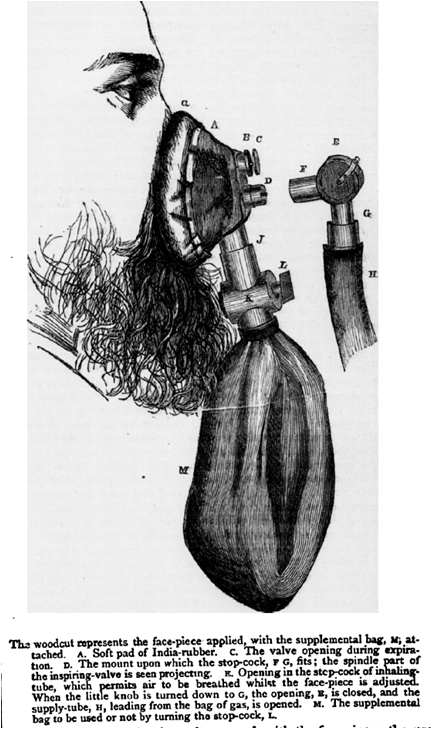 Over the next few months, Clover adapted his chloroform apparatus to deliver nitrous oxide. The large bag hanging over his shoulder was the perfect reservoir for the gas, and the mask allowed inspiration via nose or mouth. But air could still be sucked around the mask if it did not fit properly, a common problem in patients with beards. Clover overcame this problem by adding a supplemental bag which could be filled with nitrous oxide via the stopcock and provided a reservoir. "The gas received into this bag is so readily yielded during inspiration, that there is not any air sucked in under the face piece." 1. Clover JT. On the administration of nitrous oxide. British Medical Journal. 1868:491-2.